By Vincent Ujumadu Awka- THE Indigenous People of Biafra, IPOB, vowed Sunday that the proposed Igbo summit scheduled to take place in Awka on May 21st, 2018 would never hold, threatening that such a gathering could take place only if the heaven fell. 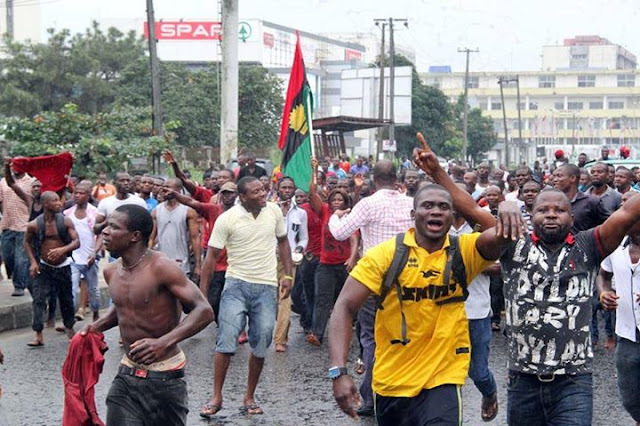 A statement by the IPOB media and publicity secretary, Comrade Emma Powerful, who described the summit as an avenue to advance the argument on the restructuring of Nigeria, called IPOB members to storm the venue of the summit from the midnight of May 20th for the purpose of scuttling the summit. The statement read: “May 21st, 2018 is the D-Day the leadership of Ohaneze Ndigbo has slated to kill Biafrans once again in our land. “The President General of Ohaneze, Chief Nnia Nwodo has managed to convince himself and some Igbo politicians into using their restructuring Nigeria summit as a cover to further enslave our people for another 100 years. “These are the same people who instigated Operation Python Dance II that led to the murder of hundreds of IPOB youths, due to their hatred for Biafra and everything Nnamdi Kanu stood for. They cannot be allowed to celebrate their betrayal of our freedom using the cover of a summit. “IPOB had since warned Ohaneze not to bring the one Nigeria summit to the heartland of Biafra, but it has remained adamant. The only way this summit can hold is unless the heaven falls on 21st of May. “It seems Ohaneze Ndigbo does not understand the language of liberty and we shall meet them head-on in Awka on the 21st at Ekwueme Square. They should bring enough squadron of their soldiers as always to provide them protection and kill us all because the summit will not hold. “We are urging all IPOB families to mobilize to storm not just Ekwueme Square, but to saturate the whole of Anambra State and Awka from all directions on 21st of May, 2018. Awka will be occupied from midnight of the 20th of May to 5pm on the 21st. “It is clear that other ethnic nationalities have observed and realized that there is no hope left in the crumbling corrupt colonial edifice known as Nigeria, but Ohaneze Ndigbo as always, has chosen the way of self-centered politics like late Dr. Nnamdi Azikiwe in pushing on with the perverse notion of sustaining the same one Nigeria that is responsible for the death of millions of our people. “The same mistakes of the past are being repeated by Nnia Nwodo and his gang. Azikiwe’s politics of one Nigeria is what put us in the mess we are in today.